Singh, who spoke in the presence of Prime Minister Narendra Modi in Rajya Sabha, said the decision will result in decline of GDP by 2 per cent, it being an “under-estimate”. “It is not my intention to pick holes what this side or other side does. But I sincerely hope that the PM even in this late hour will help find us practical and pragmatic ways to provide relief to the suffering of the people of this country,” he said in Rajya Sabha as the debate on the issue resumed after Modi came into the House. Azad’s request was readily accepted by the government with Jaitley saying that the debate should start immediately and Modi will certainly participate in it. Participating in the resumed debate, Singh said it is important to take note of the grievances of the ordinary people who have suffered as a result of this imposition on the country “overnight” by the Prime Minister. [New Delhi]PM Pays Tributes To, Architect Of New Economy, PV Narasimha Rao on his Birth Anniversary. The President of India, Shri Pranab Mukherjee has congratulated Dr. Manmohan Singh on receiving -“The Grand Cordon of the Order of the Paulownia Flowers”, one of the highest civilian Honours of Japan. 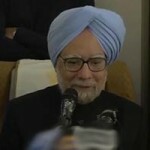 In his message to Dr. Manmohan Singh, the President has said, “I am extremely happy to know that the Government of Japan has conferred one of its highest civilian Honours -“The Grand Cordon of the Order of the Paulownia Flowers” upon you, making you the first Indian ever to receive this award. This important recognition is testimony to the immense service rendered by you over the years for the promotion of India-Japan relations and friendship. The Prime Minister, Dr Manmohan Singh has greeted the nation on the auspicious occasion of Navroz, the Parsi New Year. In his message, the Prime Minister said that Navroz marks the onset of spring and celebrates life and hope. It reinvigorates the values of peace and symbolises the rich and diverse culture of our country. May this festival bring hope, prosperity and happiness to all, the Prime Minister added. Dr. Manmohan Singh, Prime Minister of India ,Today,dedicated to the Nation “Indira Paryavaran Bhawan” in the presence of Dr M. Veerappa Moily , Minister for Environment & Forests and Shri Jairam Ramesh Minister for Rural Development . This centrally air conditioned office building has provision to accommodate about 600 officials of the Ministry of Environment and Forests is located on Jorbagh Road and in proximity to other Central Government Ministries/Departments. The Bhawan is India’s first on site Net Zero Building built by adoption of solar passive design and energy efficient building material. This building is expected to be a trend setter in the country and shall inspire people towards adoption of green technology. (i) Effective Ventilation has been achieved by orientating the building in an East-West direction, separating different blocks with connecting corridors and having a large central court yard. (ii)The design is such that 75% of natural daylight is utilised to reduce energy consumption. (iii) The entire building has an access friendly design for differently-abled persons. (iv) With an Installed capacity of 930 KW peak power, the building has the largest roof top Solar system among Multi storied buildings in India. The Prime Minister, Dr. Manmohan Singh at the dedication ceremony of the Indira Paryavaran Bhawan to the Nation, in New Delhi on February 25, 2014. The Union Minister for Petroleum & Natural Gas and Environment and Forests, Dr. M. Veerappa Moily and the Union Minister for Rural Development, Shri Jairam Ramesh are also seen. (v) Total energy savings of about 40% has been achieved by adoption of energy Efficient Chilled Beam system of Air Conditioning. This is an innovative air conditioning system, where air conditioning is done by convection currents rather than air flow through diffusers and chilled water is circulated right up to the diffuser points unlike the conventional systems. (vi)Green materials have been used like Fly ash bricks, regional building materials, materials with high recycled content, high reflectance terrace tiles and rock wool Insulation of outer walls. (vii) Rapidly renewable Bamboo Jute Composite material has been used for door frames & shutters. (viii) UPVC windows, with hermetically sealed double glass. Calcium Silicate ceiling tiles having high recycled content andgrass paver blocks in pavements and roads. (ix) Reduction in water consumption has been achieved by use of Low discharge water fixtures, recycling of waste water through Sewage Treatment Plant, use of plants with Low water demand in landscaping, use of Geothermal cooling for HVAC system, rain water harvesting and use of curing compounds during construction. The cost of the project is about Rs. 209 crore including the cost of land, solar photo voltaic power generation and its evacuation system, three level mechanized basement parking system, air-conditioning system supported by geo-thermal cooling, IT services, audio and video system in auditoriums & committee rooms, furniture, provision for horticulture and other services. The building has an earthquake resistant structure with a total plinth area of 31,488sqm. The building covers only 30% of the plot area. More than 50% area, outside the building, is a soft area with plantation and grassing. Even circulation roads and pathways are a soft area to enable ground water recharge. Robotic parking system in the basement can accommodate 330 cars. Provisions have been made for a cafeteria roof garden, as well as a gymnasium and yoga room for recreation and wellness of the employees. The office has been furnished with modular furniture & work stations. Thin client networking system has been provided instead of conventional desktop computers to minimise energy consumption. A Solar power generation system has been provided at terrace level, by creating 6000sqm support area, for meeting with the complete power demand of the building. Power generation has already started w.e.f. 19.11.2013 which is being fed to the NDMC grid. The Indira Paryavaran Bhavan building has already received the following awards. President accepts resignation of Kumari Selja from the Council of Ministers.Additional Charge Of Ministry of Social Justice and Empowerment Has Been Allotted To Rail Minister. The President of India, as advised by the Prime Minister Dr Man mohan singh , has accepted the resignation of Kumari Selja, Minister of Social Justice and Empowerment, from the Council of Ministers, with immediate effect. Further, as advised by the Prime Minister, the President has directed that Shri Mallikarjun Kharge, Minister of Railways shall be given additional charge of the work of the Ministry of Social Justice and Empowerment. The Deputy Chairman, Planning Commission, Shri Montek Singh Ahluwalia, the Union Minister for Overseas Indian Affairs, Shri Vayalar Ravi, the Chief Minister of Kerala, Shri Oommen Chandy, the Chief Minister of Haryana, Shri Bhupinder Singh Hooda, the Chief Minister of Gujarat, Shri Narendra Modi and the Chief Minister of Meghalaya, Mukul Snagma, at the 12th Pravasi Bharatiya Divas Engaging Diaspora Connecting Across Generation, in New Delhi on January 09, 2014. Prime Minister, Dr. Manmohan Singh, has congratulated the scientists and engineers of Indian Space Research Organization (ISRO) for the successful launch of GSLV D5 carrying GSAT-14 payload. Commending ISRO for the successful launch, he described it as yet another important step that the country has taken in the area of science and technology. The Geosynchronous Satellite Launch Vehicle [GSLV] D5 was launched from the Satish Dhawan Space Centre in Sriharikota today.